I walked to P and M's barge today, called in for a cup of tea, to see how she was. She was strong as usual. Big old friendly armchairs in a 14ft X45ft wooden cabin, looking through picture windows over the wildest and remotest section of the River Deben. Across a wide bend of shallow bird teeming salt water are the Sutton Hoo Saxon burial mounds among the trees on a rise less than a mile away. 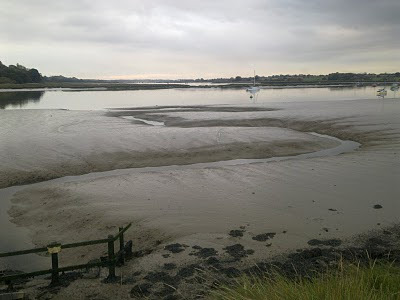 It was raining and after a cup of builder's tea I carried on along the river wall with a mission to get back my dinghy. I walked to the Wilford Bridge two miles upstream and back down river on the opposite bank, through woods shining with rain and eventually past the famous Sutton Hoo to a point right opposite Storm Petrel in Ferry Quay.My dinghy had been left there last Sunday when I'd walked the same path the other way around. I'd seen nothing in particular; A long view of old Dawn Breaker across the river and P and M's black Noah's Ark barge next along the bank. I'd enjoyed being out in the rain but shivered at the sight of a man kneeling behind the sea wall surrounded by camping gear, a vagrant with a bicycle, eating eggs out of a camping tin, with ice on the pond next to him. I'd seen him at the same spot on Sunday, it was his pad. Nothing stood out much on such a rainy day in February, oh but there was a bunch of snowdrops just beginning to flower. The dinghy rowed nicely across the two hundred yards of water, at an angle to stem the flood tide. Loba stood in the bows panting at every buoy we came near to and then we arrived back at Storm Petrel. I had a rucksack of pine cones and went straight up into town to Ye Olde Bell And Steelyard to place them in Siggy and Adrian's fireplace, where I sat with a couple of mugs of coffee while soothing my back and legs and drying my coat and boots. Then in the evening a good rehearsal with the jazz trio. Loba and I shall sleep well tonight.